I recently started reading a food magazine called Lucky Peach. The Spring issue had a an interesting article comparing haute cuisine to haute couture. It explained how a famous chef would come up with a truly original idea and how that idea would make its way down the culinary food chain from fancy tasting menus, to chain restaurants and eventually to the frozen food section at the local grocery store. The food item that they featured: molten lava cake turned mug cake. They talked about how the first lava cake is credited to the famous French chef, Michel Bras who patented his chocolate coulant (french for “runny”). He was the first one who created individually portioned lava cakes which involved placing chilled ganache inside cake batter and freezing it overnight. The result: a cake that is cooked on the outside with the inside still runny. This idea made it’s way to other Michelin starred restaurants and then down the ranks to casual dining restaurant chains, theme parks and now the frozen food section of grocery stores and Wal-mart. But wait – it doesn’t end there. 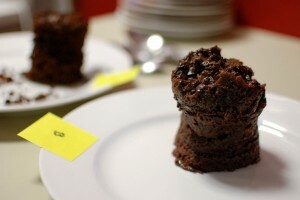 The most recent rendition of Michel Bras’ chocolate coulant is chocolate mug cake. Mix the ingredients into a microwave safe mug and microwave for 2 minutes. Voila! An individually-sized chocolate cake with a runny centre (all with just the push of a button). Please try a bit of each one and comment on the appearance, texture and flavour. Which one do you like more? Would you make mug cake? I am a lot more aware of preservatives and additives in boxed mixes and how that can effect the taste. However, in previous taste tests, they have sometimes been hard to detect (it depends on the mix). I think that this mix will be less forgiving because it only calls for the addition of milk (no eggs). The homemade version calls for eggs, milk and vanilla so I think the texture and taste will be better overall due to these fresh ingredients. But who knows? It’s a mug cake! What will they think of next? There were mixed reviews with both the instant and homemade mug cakes. The instant one was too dry and the homemade one wasn’t sweet enough. However, neither of these mug cakes were runny in the middle. And even as a regular chocolate cake, they both didn’t look appealing. But people were floored by the amount of calories in one mug cake – 420 calories! If I’m going to treat myself to something that has that many calories, it had better be worth it. When it comes to dessert, it really should be a treat. Neither of these mug cakes looked appealing and there were issues with texture and taste. Why settle for a mug cake that has challenges with texture and taste (and also looks totally ghetto)? Treat yourself right and take the time to measure out the ingredients, grab a muffin tin and bake some nice lava cakes in the oven (it takes less than 30 minutes). Or if you prefer, just go out and get yourself a really nice piece of cake. There are so many better options such as going to your local grocery store and buying a single piece or buying a box of frozen desserts that come individually wrapped. As for a microwavable cake in a mug: I’d reserve this method in case of emergencies (i.e your oven is broken or you have a serious (and I mean serious) chocolate cake craving). Or if you feel like demonstrating it for the fun/novelty factor. I think A is the ‘from scratch’ and B is the pre-mix. The ‘b’ is more lava-ish and chocolaty. Since it’s over 400 calories per pouch, I assumed ‘b’ was pre-made. The taste was OK for both I guess, but it was really the texture that was a disappointment. A: dry, crumbly. But way too dry. There were two A cakes made. The first one was absolutely awful. My piece became rock hard. I had to toss it. The second A cake was much better, moist and soft and fluffy. No melted chocolate centre. B: like a pudding, and gelatinous. The chocolate chips were melted, but certainly not a melted chocolate liquid centre. The nutrition information on the instant is atrocious!!! The calories and the sugar… wow. Just on that alone would I not buy it. The fact that it doesn’t even produce a good product seals the deal for me. Sorry, Dr. Oetker! Wow! The office smells really good and thanks to molten lava cake B!!! Cake B looks much better, is moist and smells good! Also the rich cocoa colour is to die for! However, it’s a bit too sweet for me. My guess is that Cake A is the mug cake (looks like it’s overcooked). Cake B is probably made from scratch. I’d fall of my chair if this isn’t the right answer! Thanks Lisa for doing this very yummy taste test! Cake A I could hammer nails with. Cake B was more moist but still very bland. Chocolate cake testing had so much yummy potential too! Cake A: The appearance of this one was very crumbly and dry. However, from a taste standpoint, it tasted sweeter. I liked this one more from a taste perspective. Cake B: This one was a lot more moist but wasn’t as sweet and tasted more bland. I liked this one more from a texture perspective. They both weren’t runny in the centre so I’m not sure if it’s a true representation of a molten chocolate cake. It’s more like a general chocolate cake. However, they both didn’t look appealing at all. 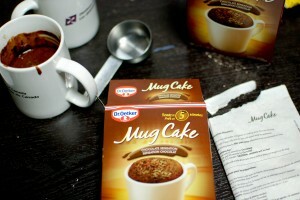 I don’t know if I would ever make chocolate cake in a mug – it seems kinda ghetto. Neat idea though. Cake A : Soft and moist. Taste was not bad. Cake B : Tougher and a bit dry. Melted chocolate chip areas tasted better due to the moisture, however chocolate chips were too sweet. I agree with the above comments, nuked chocolate cake in a mug doesn’t appeal to me either. Neither looked very attractive on the plate. I agree with what you said towards the end- “go out and get yourself a nice slice of cake” I do that to keep my weight down AND because I don’t want to take the time to bake (don’t judge 😉 ). I’m glad that you went through the ‘taste test’ for us!